When your child or a loved one graduates from high school, it is time to celebrate! Graduation parties are memorable moments in one’s life and thus they need to be celebrated in style. We are one of the most popular graduation party venues in Houston, Texas. We work according to your budget and taste and organize events for a small group or a large number of guests with perfection. 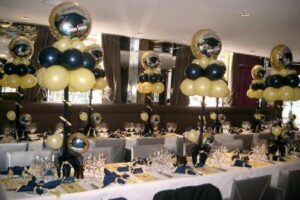 From best of food to decorations we will make the event memorable. Most importantly you won’t have to worry about the cleanup job the next morning! Azul is one of the most centrally located graduation party banquet halls in Houston making it easily accessible for your guests. We have a large venue including VIP section and can organize parties within the magnificent hall. Our professional staff will plan the event meticulously with you and always be at your disposal to make sure your party goes as planned. From choosing the food and beverage served to arranging for the special cake we will do all that it takes to create a perfect evening. Food is one of the most important parts of any graduation party and our chefs would serve extraordinary dishes that are pleasing to the eye and taste amazing. They can prepare dishes from around the world in traditional style that caters to different tastes. Our menu offers you many different choices of meat and vegetables.